Twitter is ephemeral. Tweets are short, throwaway observations, which capture the present moment, flow past quickly and are succeeded by more recent and relevant ones. We’ve looked at a way to favourite tweets, and to bookmark the URLs they may contain, but once you’ve done this, why would you want to keep a tweet? Why would you want to tweet in advance? You can scroll through your last few thousand tweets or so (which might cover quite a span of time, depending on how prolific you are) but searching and looking at hashtags won’t take you back very far, only a few days. And yet… although finding past tweets might be difficult, they can come back to haunt you. If you want to find a tweet, it might be quite tricky, and yet if you want a tweet to disappear, someone may be able to dig it up! Let’s look first at deleting. You can delete your own tweets, by hovering over it and using the option that appears below next to ‘reply’, ‘retweet’, etc. If you make a mistake in a tweet, it might be less confusing to send another tweet with a correction rather than delete one that people may already have seen. If you tweet something you shouldn’t… well, don’t! However, you can’t delete someone else’s tweets, so if they’ve already retweeted you, taken a screenshot or archived the tweet using some of the options below, it might be too late! But what if you want to keep tweets, either your own or someone else’s? Why might you want to do this? Perhaps you want to preserve a selection of good advice or observations on a topic, when you asked for suggestions on Twitter and got some great responses. You might want to keep and share them with others. You can save a link to individual tweets. Each tweet has its own URL. To find this, you click on ‘expand’ below the tweet, and you’ll see the date and time stamp. Next to this, it says ‘details’. If you click on ‘details’, it will take you to the URL of that individual tweet, which you can copy and paste. You could save it, bookmark it, embed it in a website, or email it to people. This form might not be the best or most convenient way to present tweets for others though. If you want a copy of all your tweets, then Twitter can send you an archive of everything you’ve tweeted. Click on the gear icon, and select ‘Settings’. In your ‘Account’ page, scroll down to the bottom where you will see an option “Your Twitter archive: Request your archive”. However, one of the nicest ways to keep tweets, especially for others, is a third party application called Storify. Storify is the tool which makes a narrative overview of tweets and other social media by linking to content on the web, including tweets, websites and blogs, Facebook posts, Youtube videos or photos on Flickr. You can search for content, drag and drop it into a linear narrative, add some comments to contextualise it, and publish it on the web or share the URL. You are linking to the original source, rather than taking the content, so it doesn’t breach copyright. It automatically notifies people whose content you have used in this way, so if they object to your use, you can edit out their material (all the material visible to Storify is publically visible anyway). Storify is a really nice way to create and share a summary of tweets and other online material around an event or discussion, such as a conference, blog or livechat. To illustrate what it can do, I’ve created a Storify of the #ARU10DoT programme activity, so you have an overview of the whole Ten Days and people’s contributions! There are other more advanced tools which you can use to archive tweets and present them in other visual formats, such as TAGSExplorer. These take a little more know-how to use, but might be things to explore as you get more confident with Twitter, and certainly give you an idea of what’s possible when analysing and visualising Twitter data. Here, as an example, is a visualisation of the tweets from the 2013 ALDinHE conference, and another for LD10DoT! These were kindly created by Andy Mitchell, who knows a lot more about it than I do! If you want to know more about how these visualisations were created, there are instructions online and further instructions on making a visualisation such as the ones linked to above. If there have been any tweets over the course of the programme which you think will be useful to you, perhaps ones you favourited yesterday, or ones with further resources or advice on using Twitter, try archiving them in one of the ways shown above. And what about future tweets? You can schedule tweets to send themselves automatically later on. Although Twitter is a medium which captures the moment, there are several reasons why you might want to do this. You can schedule tweets from both Tweetdeck and Hootsuite. To schedule a tweet in Tweetdeck, write a tweet as normal, and then click on the clock icon at the bottom of the window you’re composing a tweet in. 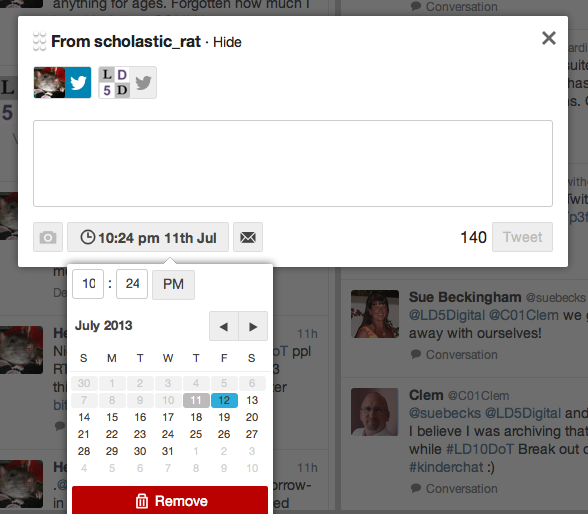 This brings up a small calendar, where you can choose the time and date when you want your tweet to be sent. If you don’t use Tweetdeck or Hootsuite, there are other apps which only schedule tweets. You might try, for example, Futuretweets or Twuffer or also Buffer (which works for other social media too). You can sign in with Twitter (or Facebook, or LinkedIn), and it will ask you for permission to access your Twitter feed. Once signed in, it will ask you what you want to share. Type in a tweet, and click ‘schedule’ or ‘buffer’. You will want to go to the ‘Schedule’ tab and set the timezone, and the day and time you want to tweet! There’s quite a bit there to play with! Well, that’s the last of our Ten Days of Twitter, but don’t worry if you’re still catching up – so are others, and the conversation will be continuing on #ARU10DoT for quite some time, I hope! We will be running another iteration in December for academic staff, and you might like to keep an eye on the programme hashtag and support academic colleagues as they learn how to use Twitter. I hope you’ve found the programme useful, and thanks for joining in! Keep tweeting! This entry was posted in Day Ten, Library and Student Services. Bookmark the permalink. Eleventh Day of #ARU10Dot: What next? #ARU10DoT by Helen Webster is licensed under a Creative Commons Attribution-NonCommercial-ShareAlike 3.0 Unported License. Based on a work at http://ld5d.wordpress.com/ten-days-of-twitter/.